Hear the voice of the young songstress and film star as she appeared on Texaco Town, aside Bob Hope on Command Performance, The Jack Benny Show, Lux Radio Theater, and Screen Guild Theater in this compilation of her great radio appearances. 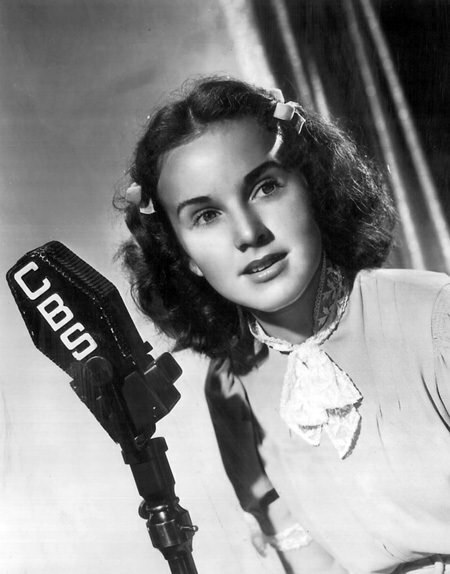 "Deanna Durbin on Texaco Town's First Show"
Songstress and Film Star, Deanna Durbin was born Edna Mae Durbin on Dec 4, 1921, in Winnipeg, Manitoba. The family moved to Southern California in 1923. Her older sister Edith recognized the youngster's musical talents and helped her to attend the Ralph Thomas Academy for singing lessons. While taking her lessons she came to the attention of MGM Executives, who offered her a movie contract. Her first picture was a short feature, Every Sunday (1936), with another young singing talent, Judy Garland. The project was an extended Screen Test for the two girls as MGM Exec's debated the wisdom of keeping two young girl singers on staff. By the time Louis B. Mayer decreed they both could stay Deanna's option had elapsed, and she quickly signed with Universal. 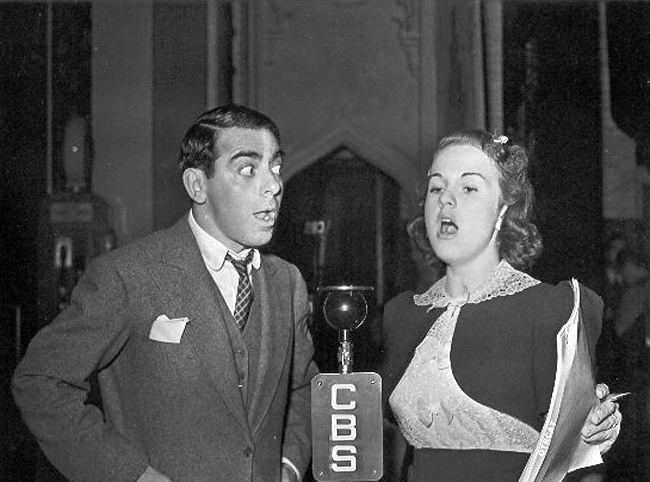 Studio official Rufus LeMaire felt that his new star and her picture would benefit from radio exposure, so he invited him to the Trocadero Club to her Deanna sing. Eddie was impressed, but wasn't confident the young talent would fit into the new show he was developing, Texaco Town. Finally LeMaire agreed to pay Deanna's fee to get her a spot on the premier of the show. Just after she started work on Three Smart Girls, Eddie introduced Deanna as his "sixth daughter" and she sang Il Bacio. The Texaco Town mail box was soon stuffed with requests to hear the young girl with the big operatic voice sing more and she became a regular on the program. Radio work made its own demands on the young singer. She wasn't always in agreement with orchestra leader Jack Renard about tempo, and developed the habit of beating out the tempo as she sang in an unconscious effort to speed or slow the orchestra- Miss Durbin was only too aware there are no retakes on live radio! Deanna knew that a heavy meal before singing could affect her vocal range, so to perform her best she would have only a glass of orange juice before the broadcast. Afterwards it would be too late for a decent meal, so on broadcast nights she often went to bed on just a cup of hot chocolate. On top of it all there was the travel. Texaco Town primarily broadcast from New York, but often travelled to remote locations. Deanna's movie work of course was in Hollywood. On one occasion she missed three train connections and had to grab a TWA flight to catch up with the train in Albuquerque--flying was not the safest means of transport in 1936! In 1936 Deanna auditioned to provide the vocals for Disney's Snow White. Imagine a 15 year old girl being told her voice was too old for the part. Deanna Durbin would make 26 films. In 1946-47 she was the top salaried woman in the US. In December 1950 she married her third husband, director Charles David, in Paris, and then withdrew from public life. She maintains her privacy, and declines interviews. 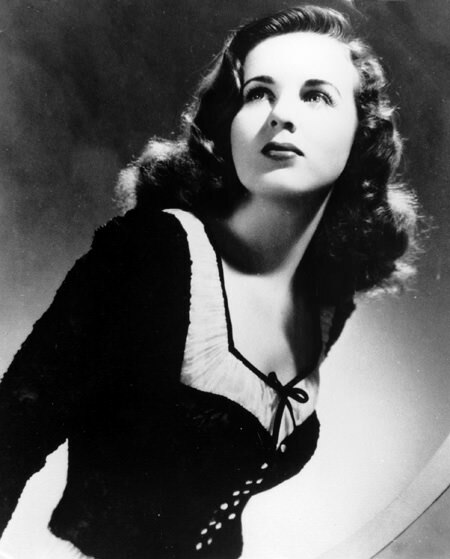 Deanna Durbin has a star on the Hollywood Walk of Fame at a722 Vine St.
Be the first to comment on "Deanna Durbin"